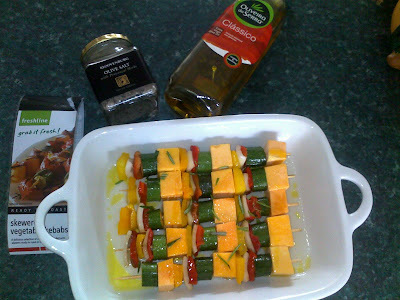 If you're looking to braai this weekend, or are just feeling lus to up your veggie quota in an uber yummy way, then I have just the thing for you. These pre-made skewers are part of the Freshline range from most Super Spars. 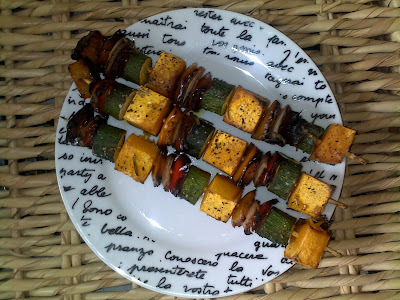 They include butternut, red pepper, yellow pepper, onion and zucchini pieces. The package includes instructions for both braaing and oven-roasting. I roasted these with a basting of olive oil, lemon juice, olive salt and fresh rosemary at 180 degrees Celsius for 1 hour. Delicious doesn't adequately begin to describe how they turned out! For those readers who are interested in knowing more about celiac disease, here is a link to a concise and informative article in the Huffington Post. Who knows, you may even discover that those achey-breaky symptoms YOU'VE been feeling for years are related to gluten too! Isn't huffington post a good thing? Wow, you cut them so neatly!